This recipe was made to meet your needs as a chef in the foodservice. An updated version of a traditional slaw with added crunch from the raddish and the sweet fresh note from the apple. Tasty for your guests, fast to prepare and very profitable with the help of our Real Mayonnaise and our Professional Basil Puree. Add the lemon juice to the apple to prevent discolouring. 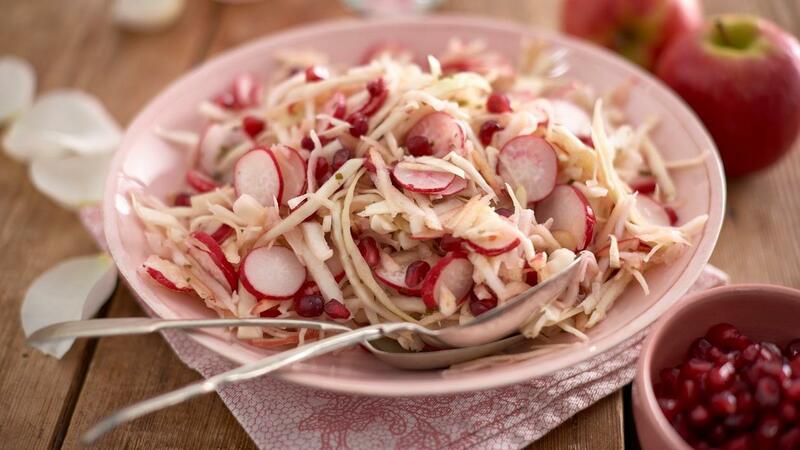 Add the radish in a large bowl together with the grated apple and celeriac and mix well. Add the HELLMANN'S Real Mayonnaise, KNORR Professional Basil Puree and mix well. If not using immediately, cover, label and refrigerate until required. To serve, sprinkle the pomegranate seeds over the top of the slaw.